Katrín Braga is an Icelandic photographer based in Vancouver. She started experimenting with film photography in secondary school, garnering attention for her colourful portraits of women. Katrín has since had her work published in publications such as Teen Vogue, VICE, Dazed, Indie Magazine, The Wild Magazine and Bullett Media. I accidentally found my father’s old film camera when I was cleaning the storage room of my house; I was around fifteen or sixteen years old. I bought some film rolls for it and haven’t stopped shooting since. What attracted me the most to photography back then was that I could document my life visually and have a creative outlet. My creative process is always different, so it’s very hard for me to pin that down. I try to work closely with the people I collaborate with so that everyone can have their creative input in the project. Photoshoots are a collaboration and I couldn’t create beautiful imagery without the talented people I work with. Strong female personalities, especially the women who are closest to me. The women I surround myself with inspire me the most. My goals now are to create something valuable and to feel connected with other people through my work. I shoot mostly women and I try to make them look and feel strong and empowered. I’ve heard so many stories from models who have felt really uncomfortable on set—who have been undermined in front of the camera. Some photographers take advantage of young models, which is horrible. My goal is to do the exact opposite. What is your favourite artwork, by you and/or another artist? I’m obsessed with Alphonse Mucha and his “flowers” series. He paints mostly women wearing beautiful kimonos and dresses, and surrounds the subject with flowers and plants. Being an artist in Iceland is definitely different than being an artist in Vancouver. 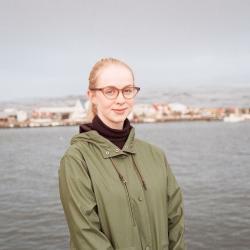 In Iceland, there’s an endless supply of creative and talented people but not enough resources to make a living out of it, especially in photography. In Vancouver, it’s easier to find work in your field, but it’s harder to find people that want to collaborate or work with you—you really have to go out of your way to find them. Vancouver also has an easier way of living and it’s warm, while Iceland can be very cold and dark, so you have to work on creative things in order to not get depressed. I recently began branching out into directing short documentaries and I find that process very interesting. It’s something I want to do more of in the future. My first short documentary explores the life of my grandfather, an ex-farmer and postman who has never left rural Iceland. In the film he discusses his father’s sixty-eight-year streak of daily diary entries, ending when he passed away in 1996.